We had quite the party on Saturday night. Only a couple of people couldn't make it because of the snow. Most people were on the metro, and it worked out just fine. We had about 22 people here, I guess. 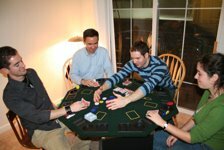 We didn't have much roulette action, but the poker room was always full, as well as the black jack table. Most of the night someone was also at the craps table, especially after Tommy showed up to tell us how to play it. The auction at the end of the night was hella fun, and nearly everyone went home with a prize (except poor Dave). We are already planning on doing it next year.